We are so excited about all our new products we are bringing to our hometown festival, the 2014 GO OTR Summer Celebration, on Saturday May 17 2014, at Washington Park. 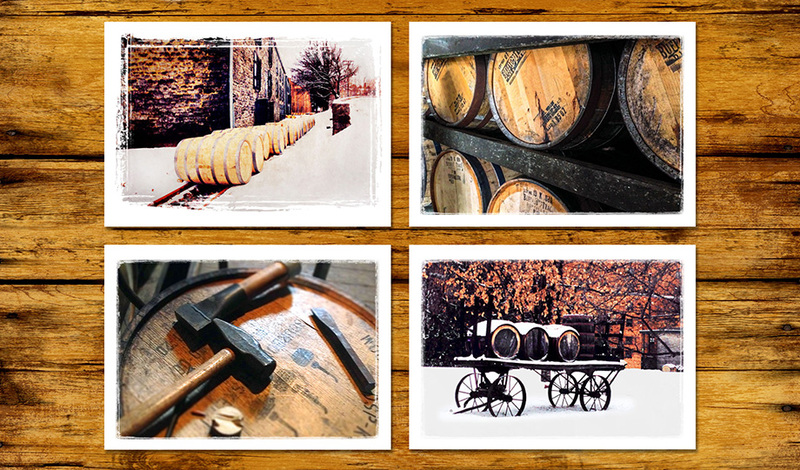 First off, we have new photographic prints and cards, taken on our winter trip to the Bourbon Trail in Kentucky. We love our bourbon, and though it was really too cold for humans to be out in the weather, the snow sure made things pretty. Our “Barrel Series” comes as a set of 4 greeting cards (or sold individually), as well as prints that come in 12×9 and some in 18×12 sizes. See all our prints here, and our cards here. 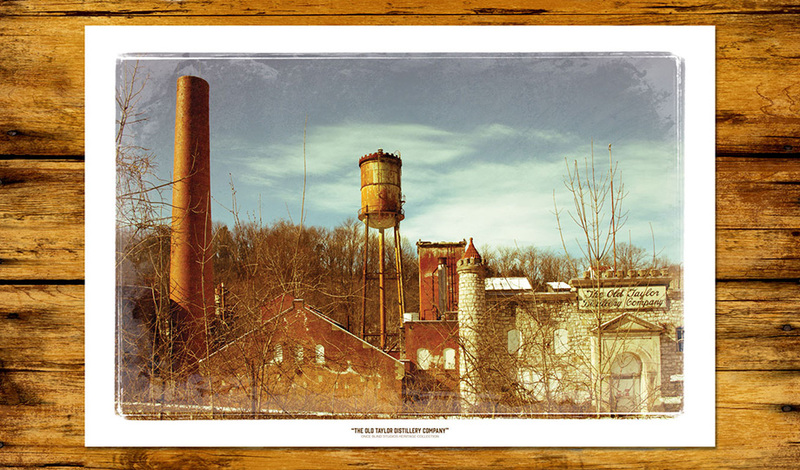 While we were driving around, we took a wrong turn and drove by “The Old Taylor Distillery”, which apparently was amazing back in the day. It has been abandoned since the ’70’s, and given our love for all things historic and crumbly, Randy had to jump out and shoot it. I stayed in the car to keep it warm for that one :). We have this print available in 12×9 and 12×18 sizes. 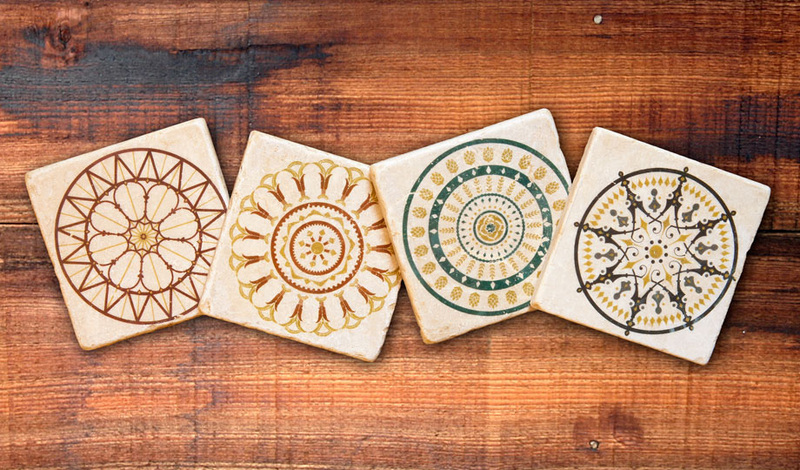 We also have new graphic design grouping; the “Cincinnati Architectural Series” which includes tumbled marble coasters and greeting cards. Each of these designs were inspired by architectural elements in Cincinnati: the large window of Cincinnati Music Hall, a friend’s staircase on Mulberry Street, the amazing art-deco Dalton Avenue Post Office, and a hops element from a building on Vine Street (where there were once so many saloons and breweries, the hatchet-wielding temperance vandal Carry Nation gave up in despair). And finally, introducing our new “Small Batch” area of the Heritage Collection! Small Batch items will be all sorts of limited production products, that we handcraft. The first offering is the “Lueckmann Votives”. The wood comes from our friends’ home in the Pendleton area of Cincinnati, which was originally built by Arnold Lueckmann in 1881. Randy cut it into smaller sections, drilled out the spaces for the votives, stained it and painted the indentation under the candles with historic pops of color. 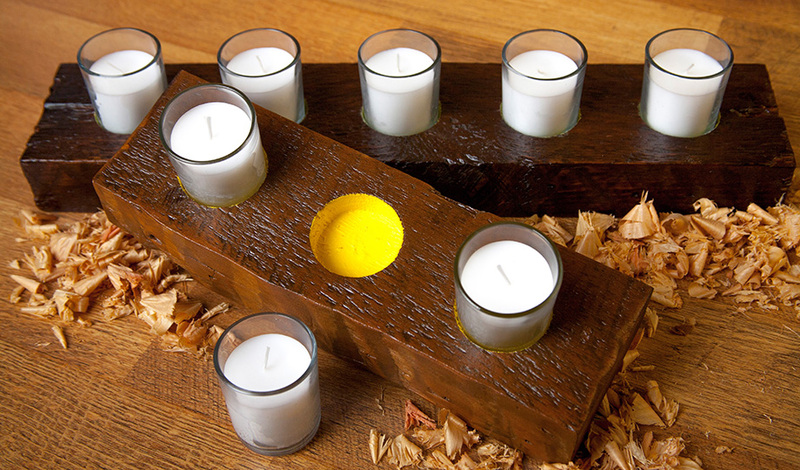 We think they are really cool; rustic yet refined. Every saw mark and nail hole tells the story of our heritage, and we just love that.